UDPixel is an amazing, free Windows software, belonging to the category Software utilities with subcategory Analysis & Optimization (more specifically Monitor). Since we added this program to our catalog in 2007, it has already reached 72,039 installations, and last week it had 49 installations. Its current version is 2.2 and it has been updated on 3/16/2007. It's available for users with the operating system Windows 2000 and prior versions, and you can download it only in English. About the download, UDPixel is a not that heavy software that doesn't take up as much space than most programs in the section Software utilities. It's a very popular program in some countries such as United States, Islamic Republic Of Iran, and India. Have you ever had an aooying pixel missing from your screen or stuck in one colour? Then this could be the solution you've been looking for. 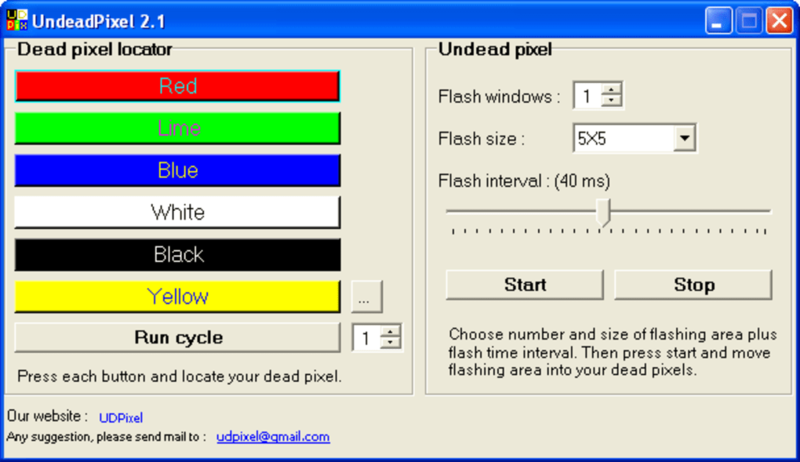 UDPixel helps to locate and fix LCD screens dead pixels. The program works by promtping pixels to make rapid changes. Note that you need to run this program for a couple of hours before it will solve the problem. The developers give no guarantees or promises but its worth a go and certainly cheaper than buying a new monitor!